OCEAN FRONT / Stunning SUNSETS 1 Bed right on the Beach. 1 Queen Bed, Queen sleeper sofa, fully equip kitchen, towels, sheets washer and dryer in unit. 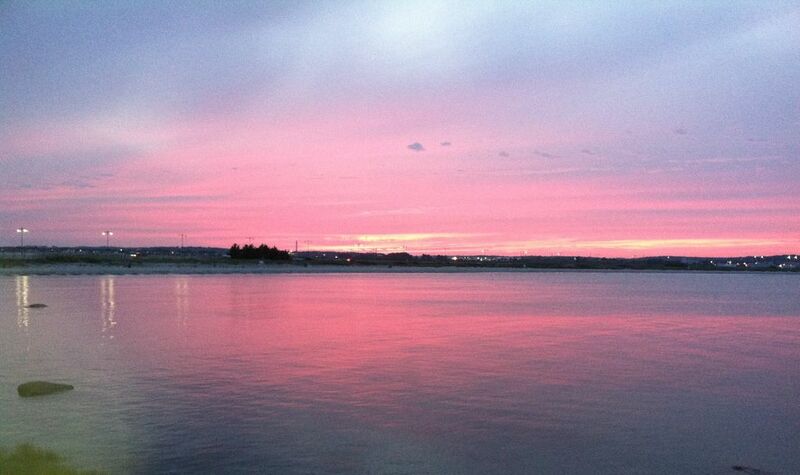 You can not get any closer to the water.. Nahant sunsets!! Watch the tide roll in and out with a glass of wine or a cold beer..a very short ride in to Marblehead, Salem.. Or if you prefer Boston only 12 miles. You would think you were on the cape but do not have to deal with the traffic. Book for the 4th of July Week. You can see at least 4 or 5 different towns fireworks right in your back yard. Nahant has tons of amazing things to do for kids on the 4th week. We also have arts and crafts and games, everyday in the park from 9-12. We also offer fall and winter short term housing . any where for m 1 to 8 month rentals. Great for a relocation or doing a house renovation. We live next door to property, my husband Rich, daughter Nora and dog's Rosie and Sharmin We are fun, laid back and love to share our beautiful property. Nahant is a real diamond in the rough. Being so close to Boston but feeling like you are isolated. The minute you drive down the causeway you feel like you just pulled the shade down from the busy life style we all have. The community is like no other very eclectic, everyone is so nice. the beach's are so beautiful you really would think you are at the cape but with out all the hassle of the traffic. If you are a kite boarder this is the place to be. Enjoy 4 different beaches. Nahnt has very little parking for non residents so the beaches are never crowed. Walk to Tides and get a fresh lobster roll and sit on the deck and enjoy oysters and a margarita. Or you can walk to the local fish market and buy a fresh steamed lobster with out having to any of the work yourself. Do you like to fish? You can surf cast right out of our yard at high tide. Neighbors have caught 40 lbs Stripper.. You will never want to leave this fantastic community. We loved it! It really was a special little place. Nahant is also really beautiful. Boston is so busy and bustling, that it was nice to make it back to the cottage at night. Lynn is a lovely town close by and we felt safe everywhere we went. We made a day trip to Cape Cod and Provincetown as well, so the location gives you options to see things north or south of Boston. Although too cold to walk the beach, we were able drive around and get some great pics! Great hosts! Thank you so much! Cottage was just as pictured, very clean,cozy,nice view! It was great we could have our dogs! Thank you we had a good time and would go back but maybe try a warmer holiday!! Very Pleasant Cozy Spot on Nahant Beach. Home is equipped with Everything you need. Property is Very Cozy. With Everything you need. Perfect for my Bride and I Plus our Puppies. This home was perfect for a beach getaway! The home is well stocked & the perfect size for two people. Beautiful view of the ocean from front window & great beach to stroll! Jenny is a great host and very quick to answer with any questions or concerns thg we had. I would stay here again in a heartbeat ! Had a wonderful time here. Renter was very accommodating and made our stay perfect! I will definitely be booking this cottage again for future vacations. 2 cars only, must park in driveway, 2 tandem spots.